They’re folding bikes! Here they are in the back of Angel’s mom-mobile after she bought them back in mid-November. The red one is Angel’s, the blue one is mine, and they are practically identical. They have a Raleigh Twenty style folding mechanism (ie, a big hinge in the middle of the frame – and that’s all), 20-inch white wall tires, and to our enormous surprise, Sturmey Archer 3-speed shifters and hubs. They were cheap like borscht, and look like they’ll be reliable little bikes once we tune them up and add milk crates to the rear racks. – Norco are a Canadian marque based in British Columbia, who started selling bikes (mostly copies or rebadged bikes from other makers) in 1964. They’re best known for 1970-80s BMX-style imports and the suspension-fork mountain bikes they manufactured starting in 1993 with names like the Sasquatch and the Wolverine. Unfortunately there is very little information on their history or their older bikes online. – A wonderful History of the Folding Bike helped us identify the frame style as a U-frame, produced in quantity by a number of European makers starting in the 1970s. – This is the only other photo we have been able to find floating around out there of a Norco folding bicycle. It turns out it’s the subject of this bike forum discussion, which confirmed that it’s called a U-frame. It’s one of a slew of similar ‘U’ frame [as they are wont to be described] designs that enveloped Europe in the late seventies/early eighties that were cheaper to make than their earlier more sturdy cousins by Puch, Raleigh, Dawes. I don’t know the name as a lot of these kind of frames were pretty generic and perhaps not even a Peugeot design at all. They can be fun bikes (my sister had a non-pug one named a ‘Marathon’ as her first real bike aged about 10) but most people in these forums would not consider them beyond occasional or light use as the position of the fold and single downtube without extra strengthening can make for a slighty flexy ride. (Emphasis mine.) Meh, we can live with that. – A discussion of U-frame folders on Bikehugger tells us that the Phillips Folda was a U-frame. Since Phillips was a TI-owned marque, that could explain why our bikes have Sturmey Archer parts. This recent discussion at The Raleigh Twenty confirms that TI sold U-frame folding bicycles starting in 1984 – and their History page indicates they started calling it the Compact in 1987. And photos in Flikr’s Foldr vintage-folding-bike pool show Raleigh-badged, Raleigh-badged and Hercules-badged U-frames with similar curved rear stays and rack as our Norcos – along with Italian-made Cinzia, Graziella, TicTac and Bianchi Aquiletta (which has a 3-speed SA hub). More about Cinzia’s folding bicycle can be found here. – Back to that bike forum, someone asked a question about a Norco 3-speed folder that’s marked Made In Italy. The stainless-steel fenders are stamped INOX. The brake calipers and levers are stamped WEINMANN. The shape of the brazed-on rack and rear stays is fairly unique. Interesting Y-shape in the chainwheel. Cottered cranks. Stainless steel chainguard. 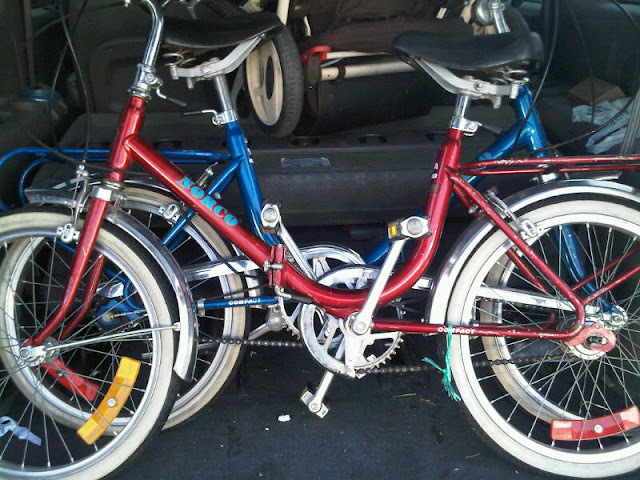 Aluminum kickstand on blue bike is marked Made In Italy; red bike is missing its kickstand. Italian-made AMBROSIO rims with SUPERGA SPORT 20 x 1.75 nylon whitewall tires. The headtube is stamped SIGUR BREVETTATO. Brevettato is a word associated with adjustable handlebars. The top of the ring is stamped OMEGA, and the lever is marked SIGUR BREV. is also marked SIGUR BREV. Folded. Those are the three-speed and brake cables. NORCO decals on headtube (above) and U-tube (below). Made In Italy decal and sales decal from The Sports Stop, Edson, Alberta on the seat tube. COMPACT decal on rear stay. Rear Sturmey-Archer AW 3-speed hubs stamped 83 2 (red, shown) and 83 3 (blue, not shown). but otherwise need very little work. Can anyone tell us more about these bikes? Does anyone know which Italian manufacturers Norco was working with? Update: It appears that (Illinois company) KTC’s Hyda Bike was made by the same Italian manufacturer, and sometimes has the Cinzia’s star-shaped chainwheel and sometimes the Y chainwheel seen above. Here are links to one on eBay, two with the Y chainwheel on IBikeDB, and one with the star chainwheel on a blog.